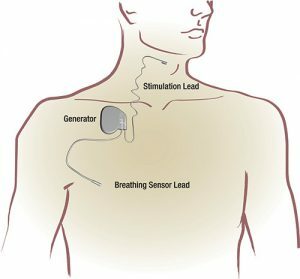 Dr. Phillips is excited to be one of only a few physicians in Florida to offer Inspire ® Upper Airway Stimulation therapy, a new, FDA-approved and proven therapy for patients with moderate to severe obstructive sleep apnea who cannot tolerate or effectively use CPAP (positive airway pressure therapy). This therapy has been studied in several major medical journals, including the New England Journal of Medicine, and has been shown to lead to a consistent dramatic improvement in sleep apnea and snoring. The therapy works by analyzing the body’s individual breathing patterns and providing a gentle stimulation to key muscles of the tongue and upper airway, to keep the airway open during sleep. The stimulation device consists of a very small generator and two small wires that are completely surgically implanted during an outpatient, often same-day procedure. With the device in place, there are no masks, tubing or devices that the patient has to wear during sleep. How does Inspire® Upper Airway Stimulation Work? The implant is surgically implanted in the chest, above the muscle (pectoralis), through a small incision. This implant is connected to two wires, or leads. The first lead is a stimulation lead that is implanted through another small incision just under the chin, which is placed around a small group of nerves that control a specific portion of the tongue muscles. The second lead is a sensing lead that is surgically placed near the ribs, that senses breathing during the night. A patient may turn on the device before sleep using a remote control, which activates the therapy. The device is designed to sense and analyze a person’s breathing during sleep, and send a gentle stimulation to the tongue during key parts of the breathing cycle, allowing the tongue and throat to remain forward. This allows the airway to remain open during sleep, treating snoring and sleep apnea.While many sleep surgeries involve reconstruction of the airway, and can be painful, the INSPIRE procedure is minimally painful, and many patients use only Tylenol after the procedure. Inspire therapy is a breakthrough implantable treatment option for people with Obstructive Sleep Apnea who are unable to use or get consistent benefit from Continuous Positive Airway Pressure (CPAP). What are the Next Steps if I’m Interested in Inspire ®? If you are interested in Inspire ® Upper Airway Stimulation therapy, call our office at (352)-372-9414, ext.223, to make an appointment with Dr. Phillips. He will meet with you and review your complete medical and sleep history, prior or current sleep studies, and perform an examination. Patients who are candidates for INSPIRE include those with moderate to severe sleep apnea, who have tried CPAP and are unable to effectively use the device to treat their apnea. Dr. Phillips will then schedule a short, painless diagnostic procedure called a drug-induced sleep endoscopy, or sleep endoscopy for short, to evaluate the anatomy of the upper airway during sleep, and identify patters of airway collapse. This procedure will help determine whether a patient is a candidate for INSPIRE Upper Airway Stimulation. Want to Know More about Inspire ® therapy? Inspire Medical Systems, Inc. has a comprehensive website further explaining Upper Airway Stimulation therapy, and includes patient testimonials from people who have had the device implanted. There are also ways to connect directly with patients who have had the procedure done, to learn about the therapy first-hand. There is also a very useful brochure discussing Inspire ® in more detail. You can download the brochure here for your review.